One of the things Carly Fiorina learned as CEO of HP was how to make use of available resources. On Wednesday, that meant capitalizing on the presence of little kids while on a campaign stop at the Greater Des Moines botanical garden. No longer were they preschoolers on a field trip—now, without the permission of their parents, they were props at Fiorina’s “right to life” forum. 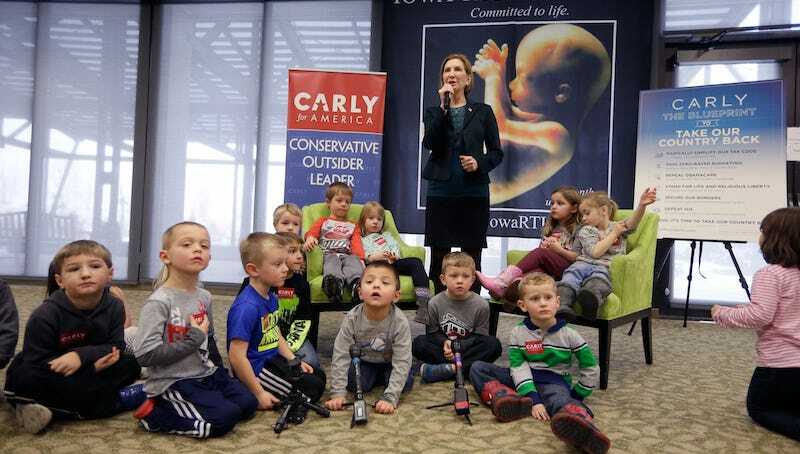 According to The Guardian, Fiorina directed 15 children to the stage, where she instructed them to sit quietly in front of a banner of a fetus while she spoke about Planned Parenthood harvesting organs. Not sure that a group of tired four-year-olds are able to give informed consent but okay :). Check out some photos of Fiorina interacting with children here.